Posted byRonnie Hughes	 May 14, 2013 May 14, 2013 14 Comments on Who are you? I don’t mean the song by The Who, though it is a very good later days Who song. I really mean ‘Who are you?’ How would you describe yourself in as few words as possible? How might you be described after you’d died? I’d been thinking about this matter of self-definition for two reasons, one deep and the other not so. Deep one first. We love a good graveyard round here, especially now that being a Funeral Celebrant is part of what Sarah does. 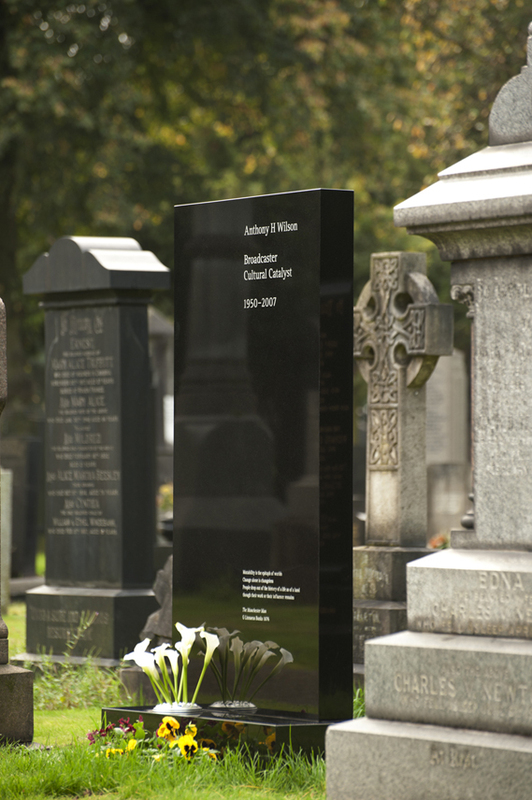 So when I found some photographs of Tony Wilson’s memorial headstone we were both impressed. 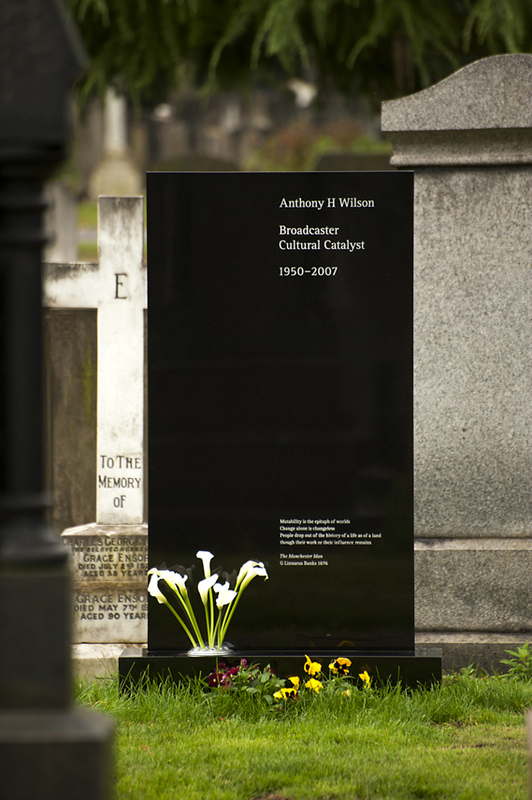 I could tell you lots about Tony Wilson, or ‘Anthony H Wilson’ as time will come to know him. But most of it would be beside the point. Because you can see from those three words above how he, or perhaps his loved ones, want him to be remembered. ‘Broadcaster, Cultural Catalyst’ and no more. Said with an elegant simplicity. 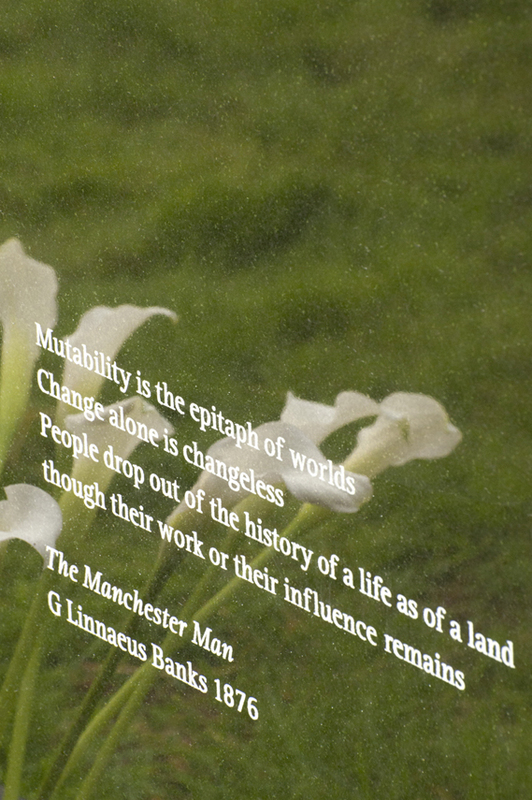 The only other words on the headstone are a literary quotation, chosen by his family. Here then, the full beautiful thing. Design by Peter Saville and Ben Kelly. The other purely practical thing that got me thinking about describing yourself in as few words as possible was that I needed some new business cards. Now that we can all be connected in so many other ways cards matter much less than they used to. 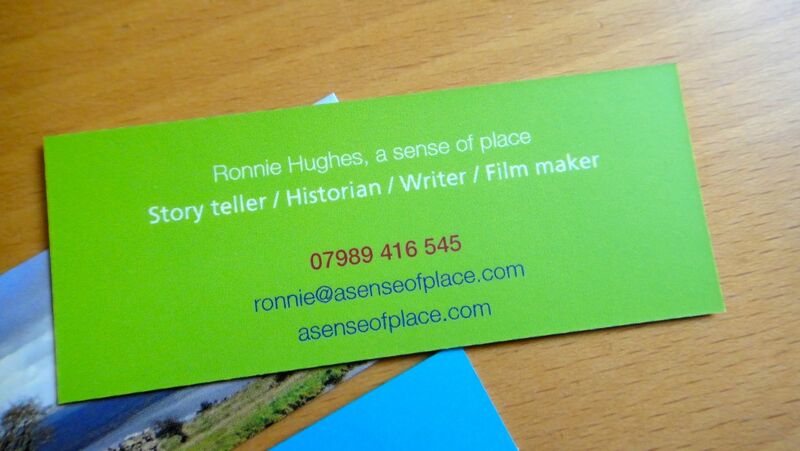 But sometimes people need your contact details and it’s easier to give them a card than have to write things down. In our early days we’d get our cards printed hundreds at a time. This might have seemed to make economic sense, but actually it was boring to be giving out the same things for so long. So these days we just get a small number and usually print them ourselves. Except this time I’d decided to get myself some of the little Moo Cards Sarah’s had a couple of times. And we set ourselves this creative exercise to design what I’d get. And yes, this exercise is just about me and what I particularly do in our work. Sarah wasn’t looking for any cards, and when she is they’ll need to be particularly about what she does in a sense of place. We’re different you see, even from each other. The photographs were the easy part, selecting from the hundreds that mainly I’ve taken for this blog over the last year or so. I picked out twenty or so, and we then settled on these nine that would work with the size and shape of the cards I was getting. 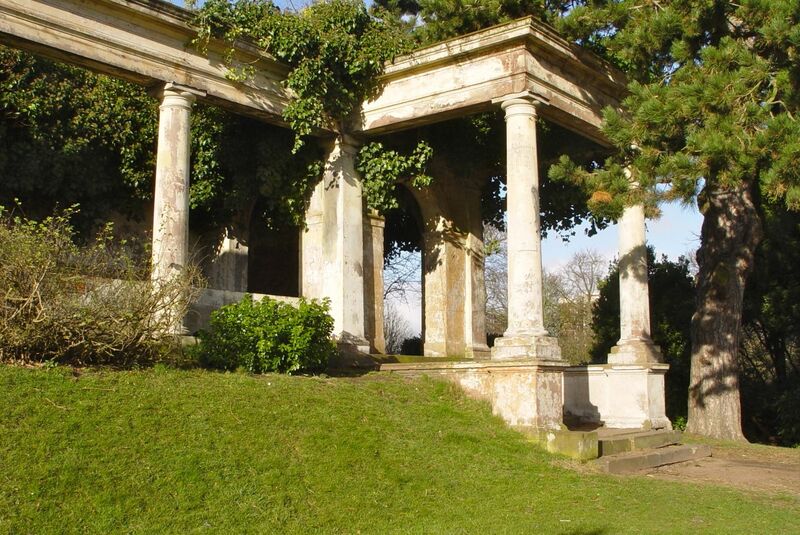 The Orangery from Allerton Towers, part of our ‘Lost Liverpool’ walk and run. 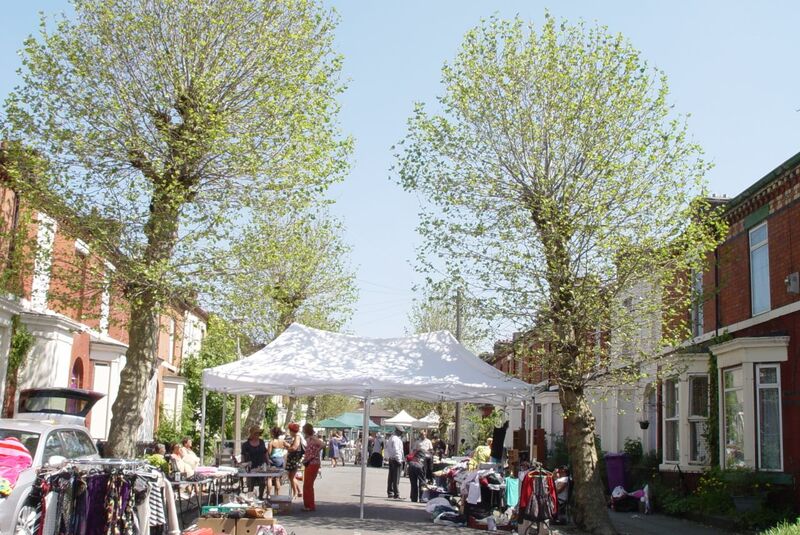 The Granby 4 Streets Market, in Cairns Street, Liverpool 8. The O.S. 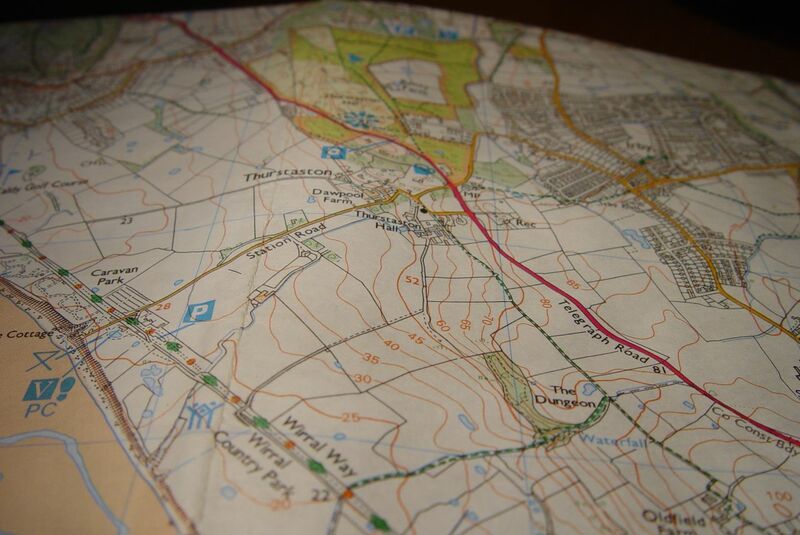 map of Thurstaston Common and the Shining Shore. 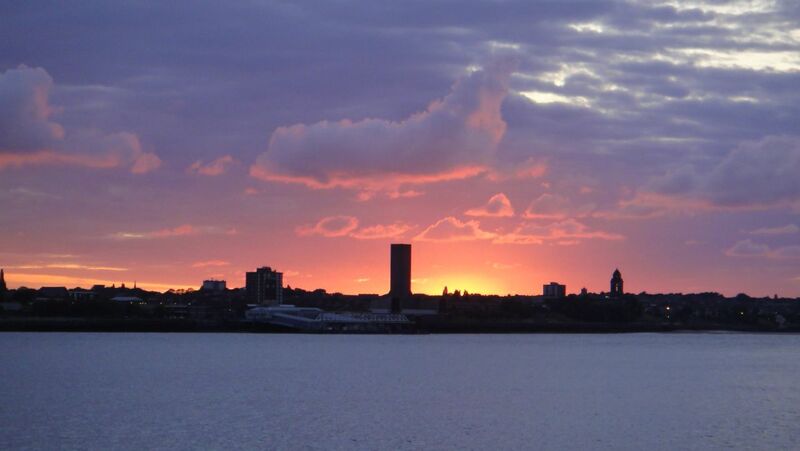 Sunset on the River Mersey. 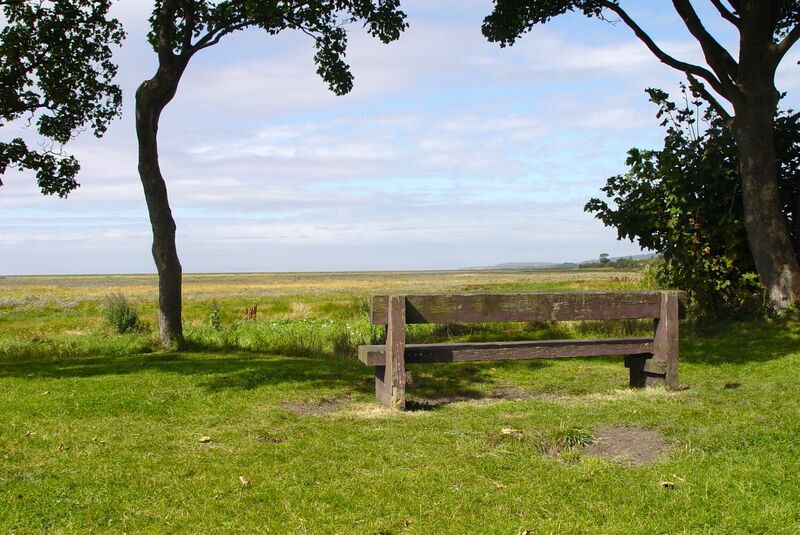 The bench at Denhall Quay, overlooking the marshlands of the Dee Estuary. 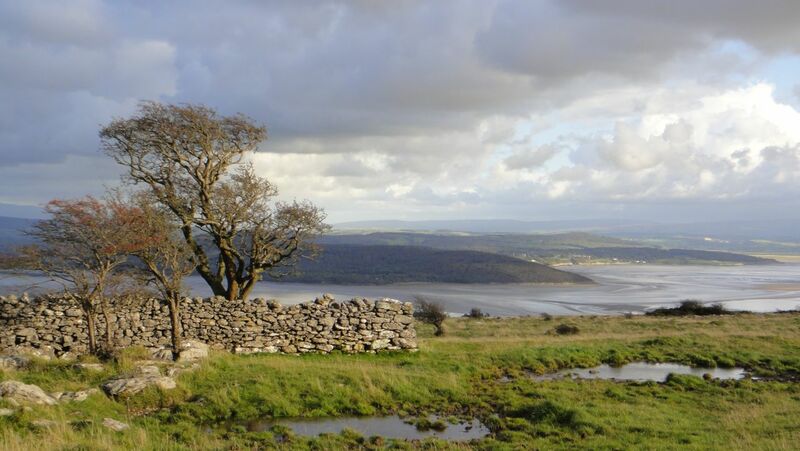 Sarah’s gorgeous picture of coming down from Hampsfell, South Cumbria. 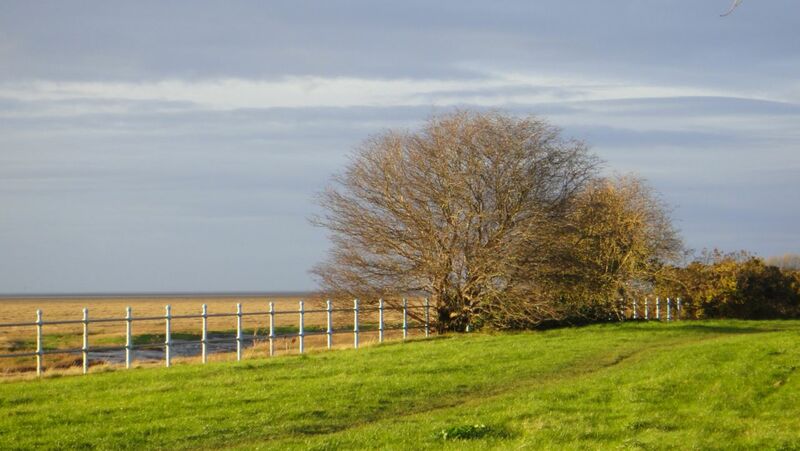 Gayton, the ‘ghost’ seaside place on the silted up Dee Estuary. 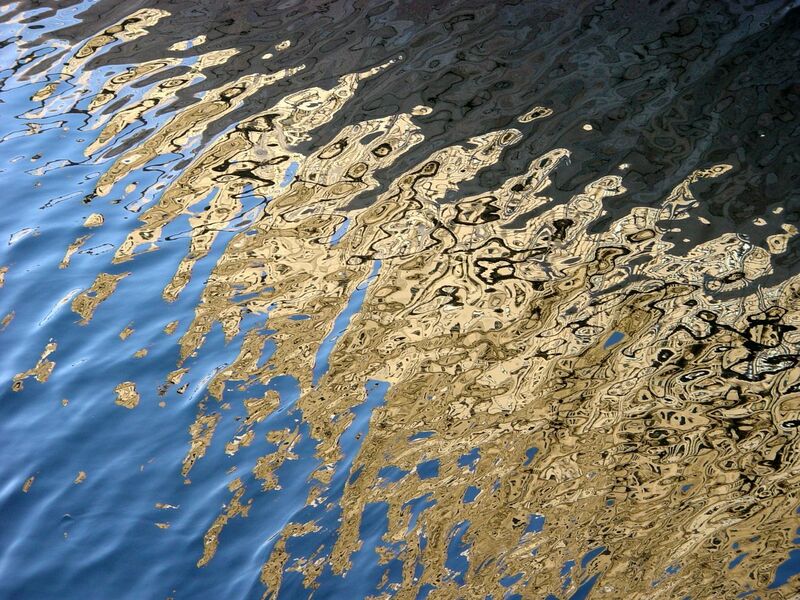 ‘Liverpool Mosaic.’ The Liver Buildings reflected and refracted in the water of the Leeds Liverpool Canal Extension. And the reason for settling on these? 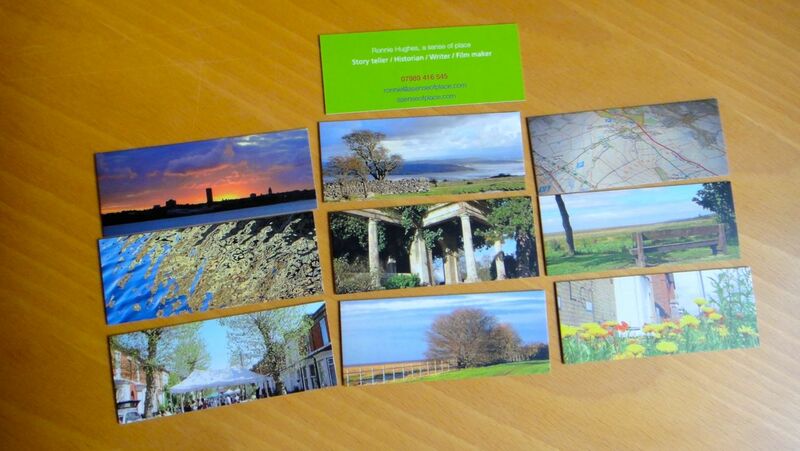 Lovely pictures of a variety of lovely and interesting places that might brighten your day if you were handed them on a little card. And then the words? Well obviously we’ve got this website and blog filled with many thousands of words about what we both do, but how could we pick just a few words about me in particular that might get you here? Well it took us a while, but when they arrived these words felt right. And the thinking behind the words? “I am a story teller. I help individuals tell and use their own life stories to discover what work they’d really love to do. And I work with people in their places and organisations on the stories of what they’ve done and stand for and what they want to do next. I am a historian. Wherever I go I’m always fascinated to know ‘What’s happened here?’ Because if we don’t know where we’ve been, we won’t know where we’re going. I am a writer, obviously. 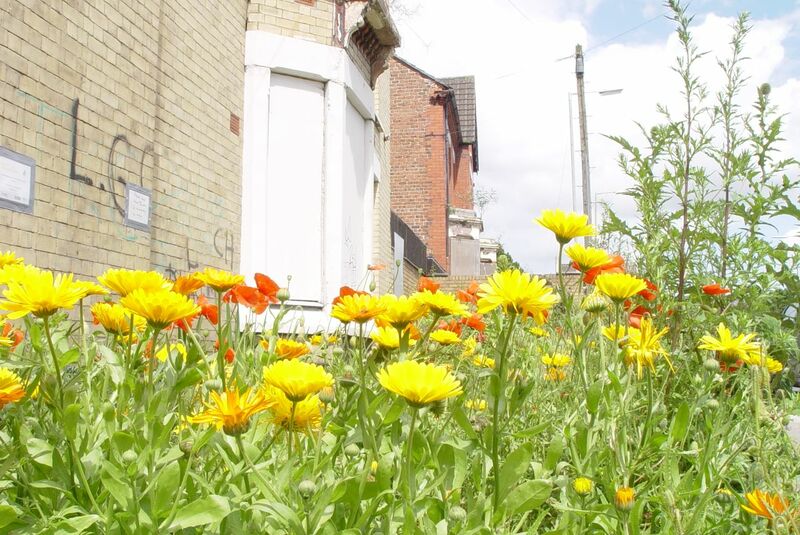 Writing this blog for the last year has involved a lot of work but hardly any effort. When I sit down to write, about our work, our lives and the people and places we find, I am doing what I love. Here’s what the full set looks like. So what do you think? What would your words be? 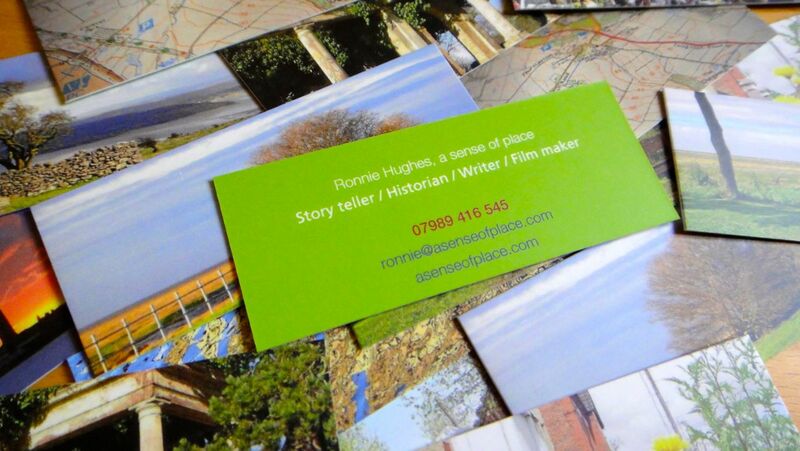 When we meet we can have a conversation about our words and our places and you can even have a card, or two. I’ve only got a hundred though, mind. Meanwhile, pleased as I am to have got down to so few words, the final image has to be from someone who got down to even less. 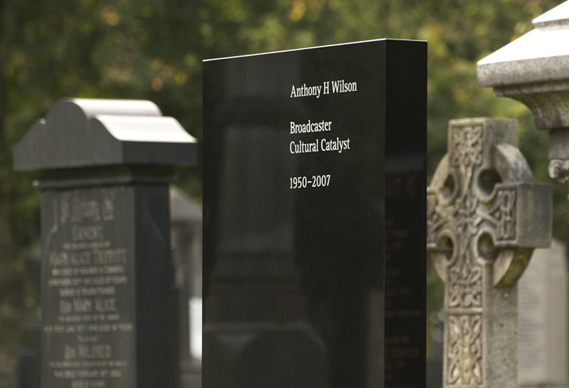 Anthony H Wilson, Broadcaster, Cultural Catalyst. Good idea and thoughtful post! Made me think anyway. Thank you Charles, clearly not over the hill yourself. But the hills seems to be getting higher! Hmm, I found this very interesting and quite moving too. Makes you think very hard about yourself. What words would I use? Maybe I should leave it to someone else, as I think I would be far too self effacing and not show my talents and potentials. I think it does help to talk it through with someone else, as I did with Sarah. But the main thing she gave me was confidence. Only you can truly define who you are. The particular word I had trouble with was ‘Historian.’ I’ve thought of myself as one for ages, but because I have no academic qualification in History I baulked at using it. ‘But it’s what you are, it’s what you do, all the time! said Sarah. So into my short list it went. You are indeed a historian, Ronnie, and a good one. This post really made me think about what I wish to be remembered for. And good timing, too, since I am in Stage IV of the disease. I’ll have to consult my close friends and see what they would advise. I hope somewhere the word “encourager” would appear, as I try to do that in my daily life. Thanks for this great post. Loved the mosaic!! Thank you Jan, glad you loved the photograph. I could hardly believe it when I pointed my camera at the water and that image was there. Months and megabytes of Photoshop processing couldn’t have achieved the gorgeous reality of the light and the water on that winter’s afternoon. Truly inspiring post again. Hello to my fellow historian and psychogeographer. I agree that you are a historian. I wonder if you ever think of yourself as a “romantic”, not in the soppy sense of the word, but in the sense in which it was originally used to describe people like Scott, Keats, Shelley and Wordsworth, who had such profound senses of place. I will have to think about my description of myself. It is hard for us stiff-upper-lipped Englishmen to say anything positive about ourselves. We don’t like to blow our own trumpets, but I think this will be a worthwhile exercise for me. I never once thought of myself in such illustrious company, but I get what you mean about ‘romantic’ in their terms of living a life led by a desire to be natural, emotional and personal. And why shouldn’t we be quietly free to think well of ourselves? And maybe even catch glimpses of the clouds of glory we may each be trailing behind us. This is a very difficult exercise to try and describe who we are and what we are in a few words. I’m thinking about myself at the moment and all I can come up with for me is’ reader ‘ but you have done really well with your description. I liked ‘storyteller’ very much, historian writer and film maker follow on naturally. As usual I loved the photographs you chose. First class ! ‘Reader’ sounds precisely right Mandy. And with time and conversation more words may emerge? Inquisitive, spontaneous but with caution….. Ok yes this is a hard one. Remembered by, we’ll that’s really a story about all our experiences perceived by other people in different ways. It is those stories that keep our memory alive. As no one is perfect we all have a special uniqueness. Thank you Teresa, and welcome to here. We are indeed all special and, as well as being remembered, I think it’s good for us to recognise in what ways we are special while we’re alive. I remember reading a book once (can’t remember its title, sorry) about how some Indigenous Australian peoples would be named by what they did. And their names would change during their lives as they took on new roles. So I haven’t always been ‘Storyteller.’ That has come with age.